On June 3, Ms. Aschariya Juntaravong, Consul (Agriculture) of the Agriculture Section of the Royal Thai Consulate-General Shanghai, gave an online lecture to listeners of Produce Report, in which she introduced Thai fruits and their varieties. Exports of fresh fruit from Thailand to China have demonstrated an upward trend since 1996, allowing China to become the biggest market for Thailand’s fresh fruit industry. Thailand exports approximately 200,000–300,000 tons of fruit to China each year, with a total value of 1.29 billion US Dollars in 2014. There are 22 types of Thai fresh fruits that are currently allowed by AQSIQ to be imported into China, namely, mango, rose apple, longkong, durian, rambutan, mangosteen, longan, coconut, guava, papaya, pineapple, jackfruit, litchi, pomelo, orange, mandarin, passion fruit, banana, tamarind, sugar apple, sapodilla, and starfruit. Thailand is especially famous for its mangoes. Two particular mango varieties that are very popular in Thailand are Nam dok mai and Nam dok mai seethong. Nam dok mai has a deep yellow skin and a smooth and juicy golden yellow flesh with a sweet taste and fragrance. Nam dok mai seethong, which is almost the same size as Nam dok mai, has a pale yellow skin and a similar sweet taste and fragrance. Another important variety is Rad, which is slightly smaller than Nam dok mai and Nam dok mai seethong. The skin is yellowish-orange with a sweet and slightly sour taste when ripe. Rad can also be eaten at the mature green stage. Rad green mango has a bright green skin and a tangy sour taste. All these varieties are nutritious and high in vitamins A and C, fiber, and minerals. In Thailand, ripe mangoes are typically chopped into squares and eaten alongside sticky rice with coconut milk, or in fruit salads or desserts. Green mangoes can be cut into small pieces and added to fruit salad or green salad, or eaten fresh with dressing or salt. 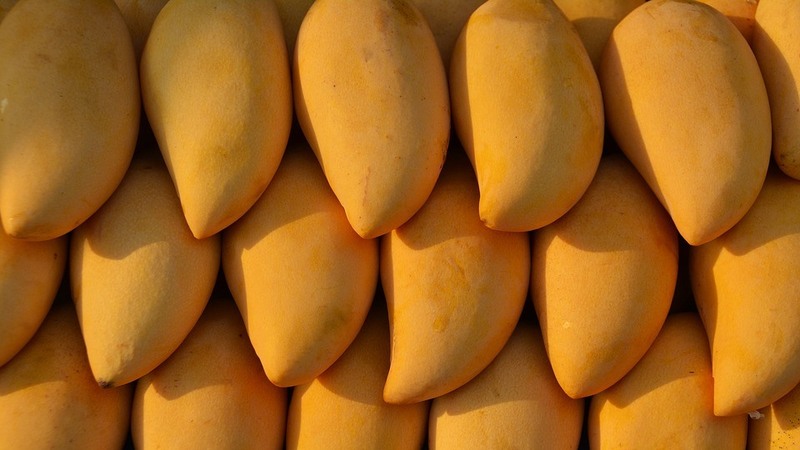 Mangoes from Thailand are available throughout the year but have their peak period from March to May. The ripe ones can be stored for 15–20 days at 13 °C. Thailand is also famous for three different varieties of rose apple, known locally as Thapthim chan (red rose apple), Petch sairung (rainbow rose apple), and Thun klao (green rose apple). These three fruits have a juicy white flesh and a crispy and firm texture, but different tastes and shapes. Thapthim chan is bell-shaped with a sweet taste and fragrance. Petch sairung and Thun klao are cone-shaped fruits with a sweet taste. They are especially high in vitamins C and B2 and phosphorus and are typically eaten fresh or added to fruit salad or green salad. These fruits are available all year round, but their peak period is January to March and they can be stored for 7–14 days at 12–14 °C. Longkong is a globular-shaped fruit of about 2–3 cm in diameter, with 5–6 unequal segments in each fruit. The fruits are arranged into bunches of 10–20 cm length. The flesh is smoky white with a sweet and slightly sour taste and is high in vitamins C and B1 and phosphorus. It is normally eaten fresh. Longkong is only available from May to September and can be stored for 18–28 days at 15–18 °C. Ms. Juntaravong explained that three of the most popular Thai fruits in China currently are longan, durian, and mangosteen. Durian and mangosteen are considered the “king and queen of fruits”, being hot and cool inside, respectively, allowing for a balanced combination. Durian can be grown year-round in Thailand, especially in the eastern areas such as Chantaburi and Rayong and the southern provinces. However, the drought in Thailand has led to higher durian prices this year. One key competitive advantage for Thai fruit exports to China is the zero tariff agreement between the two countries. Most of the produce is transported by air or land, with a smaller amount by sea. Land transport from Thailand to China is cheaper but takes 5–6 days and must pass through Laos, Vietnam, or Myanmar. Durian, mangosteen, and longan are typically transported by this route. On the other hand, mangoes are typically transported by air, despite the higher cost, to preserve their sensitive skin and ensure high quality and freshness.